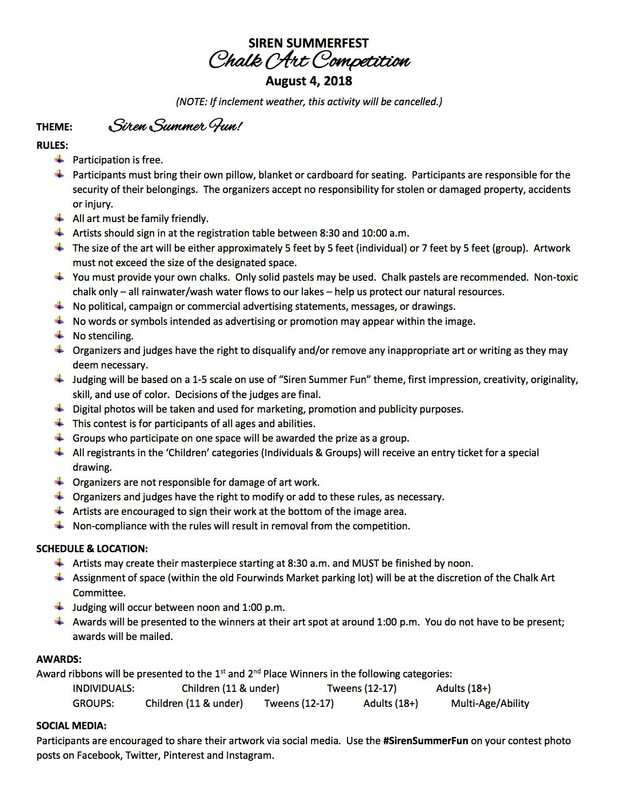 Siren’s Annual Summerfest Weekend is Filled with Fun for the Whole Family! Siren’s annual Summerfest weekend is happening this Thursday, August 2nd through Sunday, August 5th! The weekend is filled with fun events for the whole family. Look for great deals every day of Summerfest during Crazy Days Sidewalk & Summerfest Sales at select retailers and resale boutiques. Check ads for individual days and times. Our Summerfest Music in the Park will feature a 50’s and Country music mix from Bare Bones with Gary & Bob (former members of the Porch Dogs). The concert will be held from 6:30 - 8:30 pm at the Crooked Lake Park band shell. A meal and beverages will be served by the VFW. In case of inclement weather the concert will be held at Siren School. Bethany Lutheran Church will hold their annual Used Book Sale, featuring books, DVD’s and audio books, on Friday from 9:00 am - 4:00 pm and again on Saturday from 9:00 am - Noon. Bethany will also host a homemade pie and ice cream social on Friday from 10:00 am - 4:00 pm. The Fishbowl Wooden Nickel Coin Club will hold a coin show at the Siren Senior Center from 9:00 am - 3:00 pm on Saturday. There will be Motorcycle and Classic Car Show on Main Street from 9:00 am - 1:00 pm on Saturday. Siren Summerfest Market (previously known as the Flea Market) will take place in the vacant lot across from Dairy Queen from 9:00 am - 4:00 pm on Saturday. The Salvation Army will hold a fundraiser for the Back Pack Program at Crooked Lake Park from 10:00 am - 2:00 pm on Saturday. This event will feature kids games, food and beverages. A co-ed volleyball tournament will be held on the courts at the Pour House and Kris’ Pheasant Inn. Games begin at 10:00 am on Saturday. The Burnett Farmer’s Market will be set up in the Tesora parking lot from 1:00 pm - 3:00 pm on Saturday. The 9th Annual Lucky Ducky Rotary Retrieve will take place at the Crooked Lake Park boat landing at 1:00 pm on Saturday. An exciting new addition to Summerfest weekend will be the Chalk Art Competition! This event will take place on Saturday morning in the parking lot of the ‘old’ Fourwinds Market. There are many categories of participants, both individual and group, at many age levels. Event details and a registration form are attached below. One of the highlights of Summerfest weekend is the Siren Royalty Pageant. This years competition will feature Miss Siren, Jr Miss Siren, Little Miss Siren as well as a new Siren Ambassador competition. The pageant takes place in the Siren School Auditorium at 7:00 pm on Saturday. Complete event details can be found at www.VisitSiren.com/events. Make your plans to attend all of these fun events in Siren this weekend!